Yale Law Library exhibits: "Law's Picture Books"
Most people would not look for illustrations in law books. However, two exhibitions from the Yale Law Library challenge the stereotype of legal literature as a dreary expanse of dry text. “Law’s Picture Books: The Yale Law Library Collection,” opening September 13 at the Grolier Club in New York City, features 140 books and manuscripts containing a surprising and beguiling range of images that symbolize, describe, teach, argue, or criticize the law. It is curated by Michael Widener, the Law Library’s rare book librarian, and Mark S. Weiner, a legal historian, filmmaker, and professor on leave from Rutgers Law School, who blogs at WorldsOfLaw.com. A companion exhibition, “Around the World with Law’s Picture Books,” is at the Yale Law Library in New Haven, Connecticut, through December 15, and showcases illustrated law books from fifteen countries on six continents in ten different languages. It is curated by Michael Widener and Emma Molina Widener. The two exhibitions draw on a unique collection of over a thousand volumes assembled in the past decade by Michael Widener, the Yale Law Library’s rare book librarian. They were originally published for lawyers, law students, lay readers, and even children. Often they were tools in the workshops of legal practice. “These images provide insight into ideas about the nature of law and justice, and also about the image of the law and the legal profession, in the eyes of the profession itself and the general public,” writes Widener. Today they will surprise and delight both book lovers and the legal community. “A Philosophical Question” (5:14) explores the larger theoretical and historical context for the exhibit. “The Dialogue of Text and Image” (3:18) addresses the organizational framework of the exhibit. “Two Ways to Work” (4:47) follows Mike on his commute into Yale, and then examines his approach to collecting — thus the “two ways” of the title. “Love and Surprise: A Visit to the New York Antiquarian Book Fair” (10:00) meditates on the passion that drives book dealers and collectors by following Mike at the fair. “Putting Together a Book Exhibit” (1:23) provides a good-humored look into the process of curation. The Grolier Club exhibition was made possible through the support of the Charles J. Tanenbaum Fund, Yale Law School, and a generous gift from the Pine Tree Foundation. The videos were funded with a generous gift from John Robinson Block. 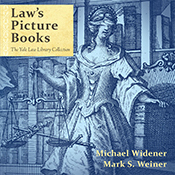 A 220-page, full-color catalogue of “Law’s Picture Books: The Yale Law Library Collection” is available from Talbot Publishing, and can be ordered via this link. It includes essays by Widener, Weiner, Jolande Goldberg (Law Library of Congress), and Erin Blake (Folger Shakespeare Library). “Law’s Picture Books: The Yale Law Library Collection” is on display September 13 - November 18 in the Grolier Club’s main gallery at 47 East 60th Street in New York City. The gallery is open 10am to 5pm Monday - Saturday except holidays, and admission is free. Widener and Weiner will be conducting exhibition tours on September 21, October 5, and November 2, 1-2pm. “Around the World with Law’s Picture Books” is on view through December 15 in the Lillian Goldman Law Library, Yale Law School (Level L2, Sterling Law Building, 127 Wall Street, New Haven CT). It is open to the public 10am-6pm daily except holidays. For more information, contact Mike Widener, Rare Book Librarian, phone (203) 432-4494, email <mike.widener@yale.edu>.